Recently Lucas and I were doing some spring cleaning and filling up a bag of old clothes to take to Goodwill. I saved an old pair of jeans and shirt of his that I loved and promised to reconstruct them into something new and useful. This set is what I've done with the jeans and shirt so far. 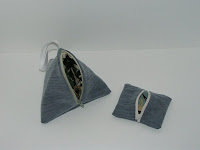 On the left is a Canmore Wristlet, and on the right is a Canmore Coin Cube. Each have denim outer fabrics from his old jeans and are lined with his old blue and green "hawaiian" print shirt. Last night our roommate came home in a panic because he had been invited to a birthday party for his good friend's young daughter today and needed a gift. He had no idea what to get for a little girl, so I whipped up this Canmore Wristlet for him to give to her, made from Strawberry Shortcake fabric. 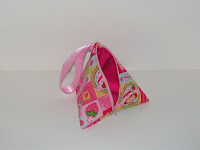 What little girl wouldn't love a mini pouch or purse she can carry around all of her little stuff in? And now I think I really need to focus on my knitting. A few weeks ago, Lucas' mom was in town and she taught me the very basics -- casting on and the basic English knitting stitch. I'm trying to teach myself binding off and increasing/decreasing from KnittingHelp.com and KnitWitch Instructional Videos, but I've been so busy making little things and getting prepared for my trip to Indiana that I've put off practicing and learning new techniques. I'd love to be able to practice knitting on the plane, but I have a feeling knitting needles won't be allowed in my carry-on bag. Oh, well.